Speak of Japanese pearls and one would immediately think of Mikimoto, whose propelled the technology of pearl culture in Japan more than 120 years ago, that eventually propelled to become the multi-million dollar business empire we know today. Mikimoto pearls are still much sort after and highly regarded in the industry for their quality. We told ourselves that we must make it a point to visit the Mikimoto Ginza 2 building when we visit Tokyo. But it is not the pearls that we are after. Not the real ones at least, but instead the plated desserts at the Mikimoto Lounge located within! The Mikimoto Ginza 2 builing located in Chuo, Ginza, one could immediately recognise the unique facade of the building which employs random shapes derived from a quasi-crystalline geometry generated by the dividing the façade planes with seven triangular shapes. It bears sharp contrast against the other buildings nearby which are pretty “standard” in steel and glass. 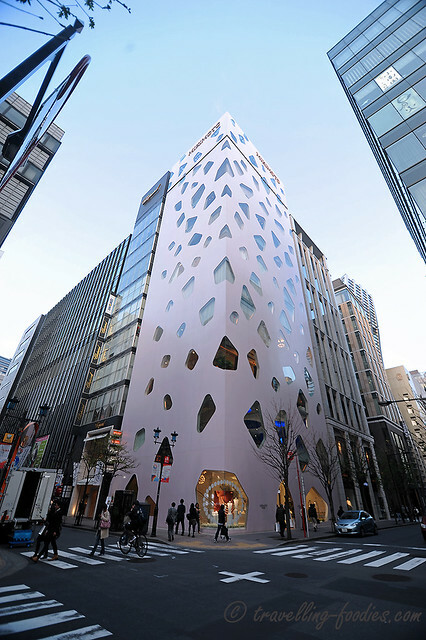 This mome-storey tall building which comprises of the Mikimoto showrooms and galleries as well as lease-out offices is the brainchild of renowned Japanese architect Toyo Ito, who is known to execute experimental concepts in design and construction methods in numerous commercial buildings around Tokyo. 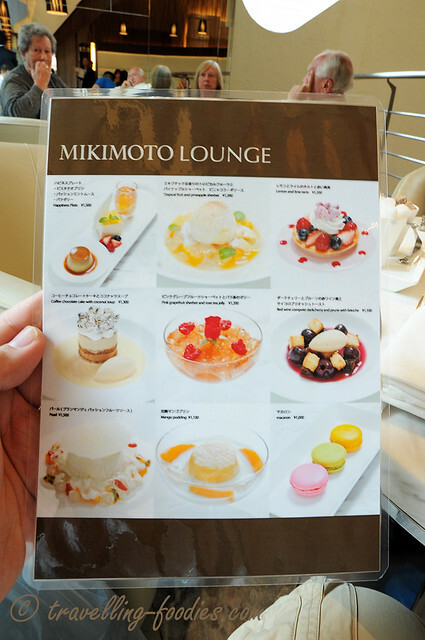 The dessert menu at Mikimoto Lounge. They do have a separate menu for meals and wines but we were here to try their famed plated desserts designed by Japanese patissier Hideo Yokota! 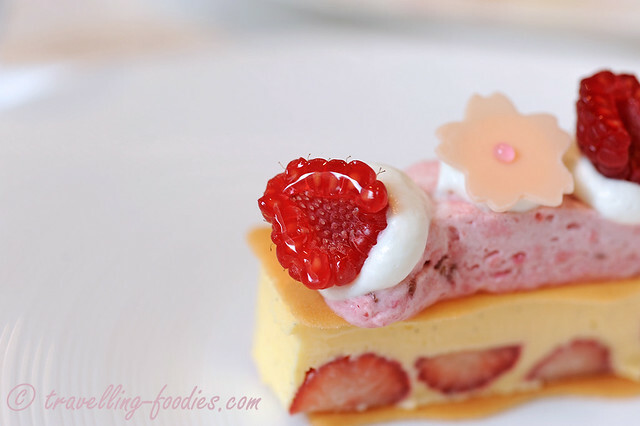 First up is a seasonal piece which celebrates the use of berries and sakura. 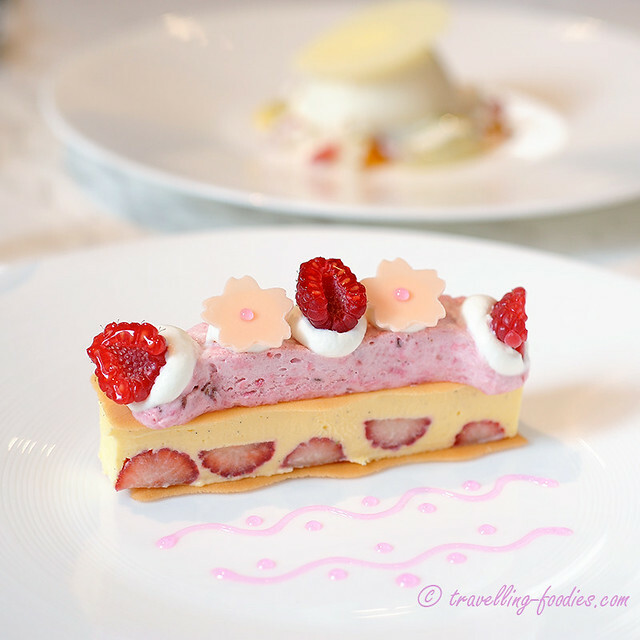 The lower layer comprise of a vanilla flavoured mousseline with fresh strawberries embedded within sandwiched by uber thin pieces of langue de chat, while the top sits a piped out tube of sakura-flavoured ice cream with dollops of creme chantilly, fresh raspberries and white chococlate decor and sakura flavoured gel. The choice of flavours were meant to depict the ushering in of spring, marked by the sakura hanami as well as strawberry season. the vanilla custard below which is speckled with vanilla seeds is really smooth and velvety which bore contrast against the fresh strawberries within in both texture and flavours. The layers of cat’s tongue biscuits despite how thin they were, were buttery and aromatic at the same time. The top layer of sakura-flavoured ice cream has the texture of a soft serve did not hold its shape for very long and thus is a dessert which could only be enjoyed in situ. The ice cream tastes really delicate. One could visually make out the tiny morsels of cherry blossom petals within but being pretty in pink, but apart from the slight savory tingling the pickled sakura offers, it really doesn’t taste very much otherwise. Enjoyed as a whole however, the combination of flavours and aroma are quite wonderful, an intermingling of sweetness and savory, while the perpetual custardy aroma of the mousseline is periodically broken by burss of refreshing tart flavours and scent of the fruits. 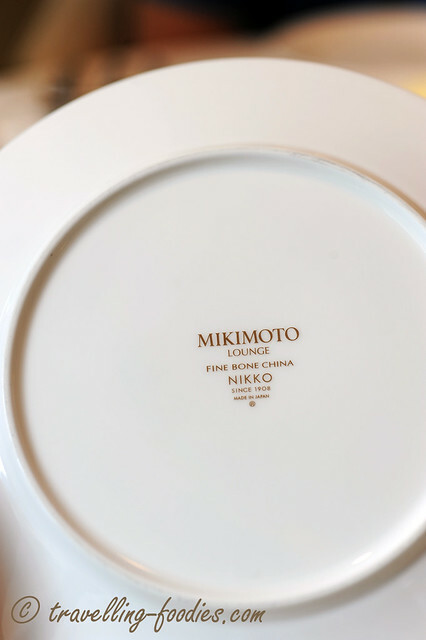 The signature of Mikimoto Lounge is a plated dessert dubbed as the “Pearl”, a tribute to Kokichi Mikimoto, the founder of the Mikimoto Group. It is visually very stunning, containing a blancmange as a centre piece in sheer white, exuding a deep sense of purity and elegance, with an assortment of condiments along its perimeters. It is made to resemble a pearl oyster metaphorically, with the piece of white chocolate on the surface as the shell while the the blancmange or perhaps the transluscent sago pearls around it are the much coveted pearls within. The surrounding components are carefully thought through, with reconstituted goji berries, white jelly fungus, morsels of aloe vera as well as passion fruit as well as alphonso mangoes. 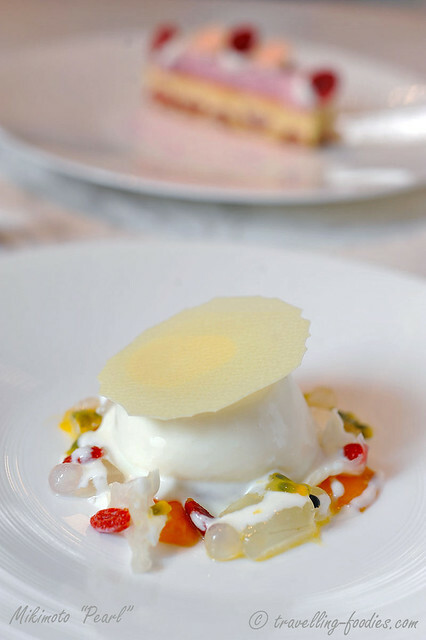 Together they offer a plenitude of flavours, textures and visuals against the white canvas of the blancmange. To some, the sheer number of elements incorporate may seem to make this plated dessert look very “busy”. But to me, Chef Hideo Yokota’s intentions are very clear. The components simply offer a large number of ways in which the blancmange could be enjoyed with. 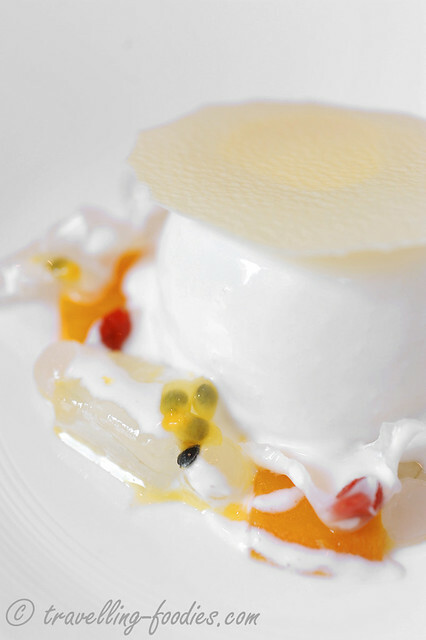 pudding with mango, pudding with white jelly fungus, pudding with passion fruit, etc… you get the idea. The other intention of the piece is not just to showcase how delicious and visual stunning it can be, but more importantly, the beneficial medicinal qualities they are imbued with. Aloe vera and white jelly fungus are well known to be good in sustaining one’s beauty while goji berries are particularly good for one’s eyes. The textural contrast presented by the fresh aloe vera, white jelly fungus as well as the goji berries and translucent sago pearls is also quite amazing. On the whole, this highly thematic work scores very well in both content and intent. A real pleasure to enjoy as a whole. Couldn’t resist flipping a plate over to take a peep and of course, one would not expect anything less than commissioned fine bone china by renowned maker, Nikko. The sense of class and good taste is well perpetuated throughout the whole dining experience, be it in ambience, food down to the tableware used. 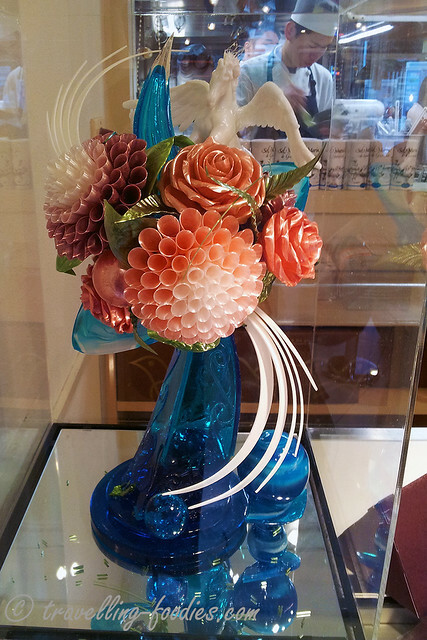 A miniature sugar showpiece on display at one of the levels in Mikimoto Ginza 2 which is no less stunning. So if you have plans to visit Ginza, do drop by the Mikimoto Lounge located at Mikimoto Ginza 2 for their lovely desserts as well as an stunning pearl-filled experience! This entry was posted on May 1, 2014 by Alan (travellingfoodies). It was filed under Food, Travel and was tagged with dessert, ginza, mikimoto, Mikimoto Lounge, Patissier Yokota Hideo, pearl, plated dessert, sakura raspberry. omg, the desserts are gorgeous! !